For several days, the Athonite monks had seen a fiery pillar on the sea rising up to the heavens. They came down to the shore and found the holy image, standing upon the waters. After a Molieben of thanksgiving, a pious monk of the Iveron monastery, St Gabriel (July 12), had a dream in which the Mother of God appeared to him and gave him instructions. So he walked across the water, and taking up the holy icon, he placed it in the church. On the following day, however, the icon was found not within the church, but on the gates of the monastery. This was repeated several times, until the Most Holy Theotokos revealed to St Gabriel Her will, saying that She did not want the icon to be guarded by the monks, but rather She intended to be their Protectress. After this, the icon was installed on the monastery gates. 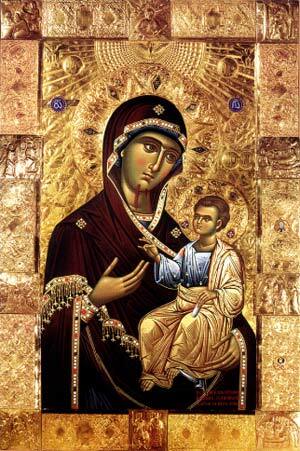 Therefore this icon came to be called "Portaitissa" or "Gate-Keeper" (October 13). This comes from the Akathist to the Mother of God: "Rejoice, O Blessed Gate-Keeper who opens the gates of Paradise to the righteous." There is a tradition that the Mother of God promised St Gabriel that the grace and mercy of Her Son toward the monks would continue as long as the Icon remained at the monastery. It is also believed that the disappearance of the Iveron Icon from Mt. Athos would be a sign of the end of the world. The Iveron Icon is also commemorated on February 12, March 31, October 13 (Its arrival in Moscow in 1648), and Bright Tuesday (Commemorating the appearance of the Icon in a pillar of fire at Mt. Athos and its recovery by St Gabriel).